Preheat the oven to 180C/gas mark 4. Put the hazelnuts on a baking tray and roast for 15 minutes or until golden. Cool, then grind in a food processor to a consistency slightly rougher than bought ground almonds. Set aside. Leave the oven on. Draw a 20cm-diameter circle on greaseproof paper on a baking sheet. Put the egg whites in a large, dry bowl and whisk until they form soft peaks. Whisk in a third of the sugar. Keep whisking until the egg whites begin to look glossy. Whisk in another third of the sugar and, when glossy, the remaining third. When the mixture looks really thick and glossy, sprinkle over the cornflour, salt and vinegar and fold in. Fold in the nuts. Spoon the mix onto the circle on the baking sheet. Shape into a disc with a palette knife. Place in the oven, reduce the temperature to 150C/gas mark 2 and bake for 1 hour. Turn off the heat and leave until cold (1-3 hours). The meringue can be kept for several days in an airtight container, or even frozen. Just before serving, whisk the cream until it forms soft peaks. Spoon over the meringue. 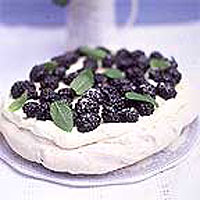 Scatter the blackberries on top and sprinkle with caster sugar. Serve immediately, garnished, if you like, with mint leaves.